Earnings after tax: MSEK 89 (74); basic EPS of SEK 2.26 (1.83). Strong cash flow generated from operating activities: MSEK 111 (78) driven by management of working capital. Group’s net debt: MSEK 92 (225); gearing ratio of 9% (29). President and CEO, David Woolley, comments on Q1 2018 interim report. Group sales for the first quarter were up year-on-year by 15% in constant currency, well ahead of the published market indices. The increased activity levels in the first quarter reflect strong demand across our core regions of North America and Europe. The emerging markets where Concentric is present also experienced strong year on year growth namely South America, India and China. The largest year-on-year improvements for the quarter were achieved in the medium and heavy-duty truck market, but there was also steady growth in construction equipment and agricultural machinery. The CBE-programme has continued to improve the group’s profitability and the reported operating margin for the first quarter increased to 19.9% (18.3) with a year-on-year operating profit drop through of 35%. Concentric already has world class technology that is well recognised in the areas of heavy duty diesel engines and hydraulic systems in both on and off highway, but last year we saw a step change in OEMs development of electric and hybrid vehicles in order to address the tougher legislation aimed at reducing emission levels. This increase of development activity has persisted into 2018 and Concentric has been working collaboratively with OEMs to find solutions that utilise Concentric’s electrically driven water pumps, oil pumps and electro- hydraulic steering pumps. Similarly, the announcements to introduce Euro 6 legislation in India (Bharat VI) by April 2020 and in China (China 6) by July 2020 have led to OEMs initiating talks with Concentric on appropriate technology solutions as they strive to introduce cleaner engines that meet these new stringent emission standards. We also continue to explore acquisition opportunities utilising our internal team and external advisor network by reviewing companies that offer enabling technologies or technologies that enhance our current product offering and/or geographical presence alongside our global customers. 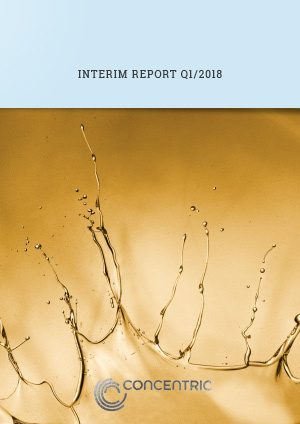 Looking forward, the orders received, and expected to be fulfilled during the second quarter of 2018, were slightly ahead of the sales levels of the first quarter in 2018. We expect that the current strong demand for the North American and European end markets will continue during the year. We have also strengthened our sales teams in order to support this continued growth. Market indices suggest that production volumes blended to Concentric’s end markets and regions will be up 10% year-on-year for 2018. Concentric remains well positioned both financially and operationally, to fully leverage our market opportunities. The information in this report is of the type that Concentric AB is obliged to make public pursuant to the EU Market Abuse Regulation and the Securities Markets Act. The information was submitted for publication, through the agency of the contact persons set out above, at 08.00 CET on 3 May, 2018.